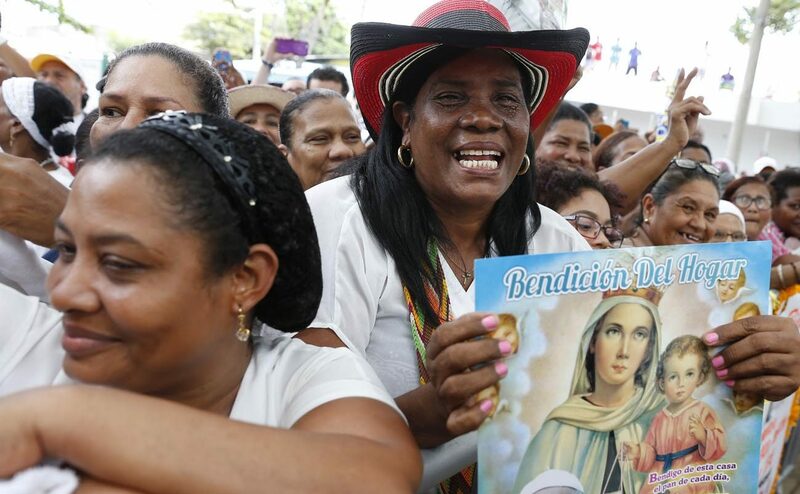 CARTAGENA, Colombia (CNS) — At the Church of St. Peter Claver, a saint venerated throughout the Americas as a champion of human rights, Pope Francis offered special prayers for Venezuela and its people suffering in the midst of a huge political and economic crisis. “From this place, I want to assure my prayers for each of the countries of Latin America, especially for nearby Venezuela. I expressed my closeness to each of the sons and daughters of this beloved nation, as well as for those who have found in Colombia a place of welcome,” he said Sept. 10 in Cartagena. Venezuela has been torn by violence and stricken with severe shortages of food and medicine as its political crisis drags on. More than 100 people have died in protests as President Nicolas Maduro has attempted to install a constituent assembly to rewrite the nation’s constitution and consolidate his power. Earlier, arriving from Bogota for the last day of his five-day visit, Pope Francis went to one of Cartagena’s poorest neighborhoods, where he blessed the cornerstone for a series of houses for particularly vulnerable people: the homeless and victims of trafficking. The homes are sponsored by Talitha Kum, an international network to fight trafficking; the network is sponsored by the women’s and men’s international unions of superiors general. The pope also visited the home of Lorenza Perez, 77, who has worked for decades as a volunteer cook at a church-run soup kitchen. “This woman became a model for all those who, in different ways, seek to restore the dignity of our brothers and sisters lost through the pain of life’s wounds, to restore the dignity of those who are excluded,” the pope said. She should be a model for those who try to provide dignified housing and care to the disadvantaged.